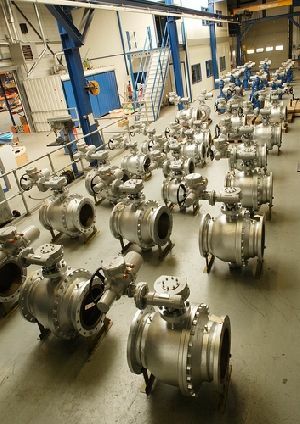 Photographed at the recently enlarged Rotork workshops in Holland, these ball valves were supplied by the valvemaker for the fitting of Rotork IQ intelligent electric actuators and Rotork Gears worm gearboxes. The completed and tested valve packages were then shipped to Krohne Oil and Gas for installation on a metering skid project. The contract is an example of the increased volume and throughput of actuation upgrade, repair and new project work that the workshop expansion programme at Rotork Holland has allowed. Amongst the improvements, the increased workshop size has more than doubled the number of actuators that can be fitted to valves at the same time. The five tonne overhead crane has been extended in range to facilitate direct truck loading and unloading, whilst two new beam-mounted 250kg cranes now serve the workbenches and a new actuator test rig, eliminating any need to manually lift and carry actuators and valves. These improvements have been introduced hand-in-hand with the implementation of new and more efficient work practices, applicable to Rotork’s virtually entire range of electric and fluid power valve actuators. Whilst the significantly sized Krohne Oil and Gas contract was in progress, the workshop was also taking care of a separate order to fit double block and bleed valves with Rotork IQ electric actuators. The actuated valve packages have been inspected by the customer and forwarded to the Vopak Europoort tank farm terminal as part of a major upgrade project at the facility.